The Trump administration has called for President Nicolas Maduro to step down. CARACAS, Venezuela — The standoff between the United States and Venezuela was temporarily defused after the two countries reached an agreement late Saturday that allowed both to keep diplomats in each other’s capitals for 30 days while seeking a broader accord on migration and bilateral issues. If no deal is reached at the end of that period, the Venezuelans said, the U.S. diplomats remaining in Caracas would need to be repatriated within 72 hours. The momentary resolution came after a morning of heated clashes at the United Nations between the United States and Russia – a longtime Venezuelan ally – over the Trump administration’s call for Venezuela’s President Nicolás Maduro to step down. European nations threatened to join Washington and leave the socialist leader increasingly isolated. Germany, France, Spain, the Netherlands and Britain gave Maduro eight days to call new elections, vowing that otherwise they would back Juan Guaidó, the opposition leader and self-proclaimed interim president now supported by the United States and a host of Latin American countries. The moves came as the Trump administration appeared to defy Maduro’s order to close its embassy by around 4 p.m. local time Saturday. Non-emergency personnel were being evacuated, though the State Department said some personnel would remain. 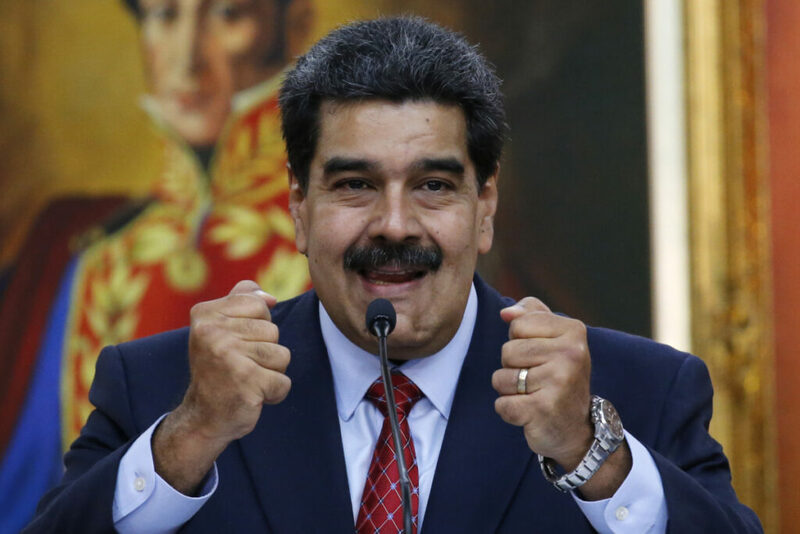 Venezuelan President Nicolas Maduro speaks at a news conference at Miraflores presidential palace in Caracas, Venezuela, on Friday amid a political power struggle with an opposition leader who has declared himself interim president. In a blow to the government and a sign of military unease, Col. José Luis Silva, the military attache at the Venezuelan Embassy in Washington, on Saturday broke with Maduro and recognized Guaidó. In a telephone interview from Washington, he said he refused the government’s order for Venezuelan diplomats to return to Caracas, and he issued a call for others in the military to follow suit. Venezuela’s self-declared interim leader Juan Guaido, speaks to supporters in a public plaza in Las Mercedes neighborhood of Caracas, Venezuela, on Saturday. The bid to topple Maduro has been remarkable for its speed and force. But in Venezuela, opponents and the West face a complex challenge in confronting not just a man, but what critics call a criminal empire. Unlike North Korea’s Kim Jong Un or Syria’s Bashar Assad, Maduro is not a one-man cult or clan leader. Rather, he rules as the public face of an omnipotent political class accused of immense corruption and narco-trafficking. While presenting themselves as red-clad revolutionaries, they have snatched up million-dollar condos in Miami and sent their children to elite international schools. The global focus has been on Maduro as strongman, an alleged usurper who opponents say staged his own reelection. Yet the re-energized opposition under Guaidó and his international backers, led by Trump, faces a broad network of figures who control food distribution, exchange rates, armories and bribes. Maduro’s fall alone, many observers say, may not bring landmark change. After the severing of U.S.-Venezuelan ties and the bold push for Maduro’s ouster, failure at this stage risks serious consequences: the conversion of the oil-rich South American nation into a full-fledged pariah. If the system survives, Venezuela would emerge as a globally isolated state entirely beholden to Moscow and Beijing, and where repression and a humanitarian crisis could take a sharp turn for the worse. Yet the opposition has found a new standard-bearer in Guaidó, head of the democratically elected National Assembly, which continued to meet even after it was stripped of power in 2017. 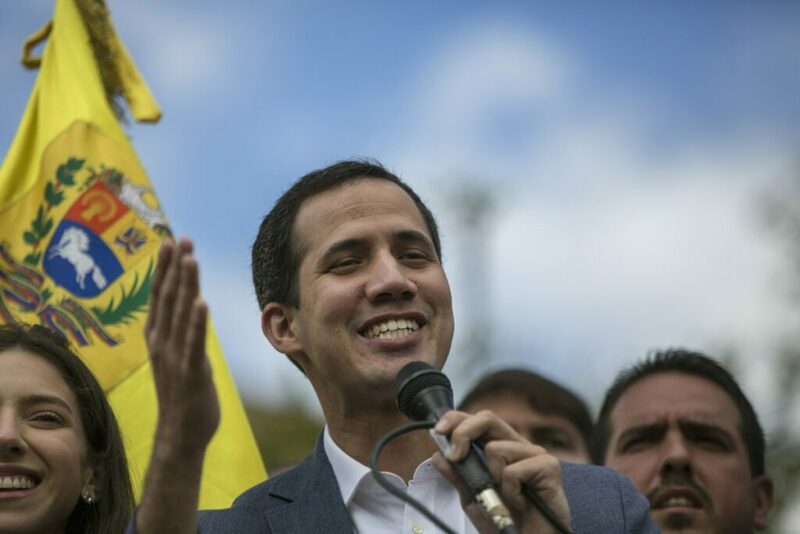 Acting in unison with the Trump administration, Guaidó has cited constitutional powers for declaring Maduro illegitimate, after a presidential election last year widely seen as fraudulent, and proclaiming himself interim president. Now, he is trying to bring down a power structure built on 20 years of “Chavismo” – or the socialist policies of Hugo Chávez, the left-wing firebrand who died in 2013. Maduro, a former bus driver and union leader, was Chávez’s anointed successor and took over as president that same year. Though many of the country’s current woes date to Chávez’s polices, under Maduro, Venezuela’s socialist experiment has fully collapsed. Hyperinflation is savaging the populace, fueling hunger and disease and prompting millions to flee the country in recent years. In Chávez’s day, the opposition held significant power. Now, allegedly through corruption and coercion, the legislative branch, the supreme court, the electoral council, the prosecutor’s office and 80 percent of mayors and governors effectively obey the ruling party. The opposition has made him a strategic symbol, seeing his potential fall as the chance for democratic restoration. To do that, they are promising something they haven’t really before: broad amnesty to Maduro backers who step aside, possibly even for Maduro, if he goes willingly. That offer is designed to send a message to the military rank and file: If you lay down your arms, or rebel against your masters, you won’t be tried. But it is also a gambit to get the powers running the country to turn on each other. In a coordinated effort with the Trump administration, the opposition is seeking to force that moment not just by calling people to the street. It is seeking to cut off the flow of cash that has allowed Maduro and his inner circle to effectively buy loyalty. The government is alleged to be awash in illicit cash; the United States has accused senior Maduro officials of narco-trafficking. But overall, cash has grown scarce as Venezuela’s oil output has plummeted, with scavengers ransacking drill sites and hundreds of workers deserting. The United States remains Venezuela’s largest cash buyer of oil. But Washington – which has imposed sanctions on more than 60 Venezuelan institutions, companies and officials, including Maduro and his wife – appears to be laying the groundwork now to redirect oil revenue and frozen assets to Guaidó’s transitional government. But it is not just the Trump administration Maduro now faces. Much of Latin America is backing Guaidó. Canada is also on board. On Saturday, the European nations came closer to throwing their weight behind Guaidó. The opposition, however, faces formidable obstacles. To ensure loyalty over the past two decades, the ruling party has taken complete control of all branches of power and placed pro-government soldiers in top military ranks, even putting military men in charge of nation’s crown jewel: The state oil company, PDVSA. In the slums in Caracas and some interior cities, meanwhile, civilian armed groups, called colectivos, have been given free rein to control territory, distribute food, and intimidate residents to attend government events and vote for pro-Maduro officials. For real change to come, all that would need be unraveled. The opposition brought hundreds of thousands to the street in 2017 for more than three months. Official repression then left more than 100 dead and ended with the installment of a pro-government constituent assembly. After failed attempts at a dialogue, the opposition was left divided and weak. Following Maduro’s allegedly orchestrated election win last May, however, its leaders sought to regroup. They began to see Maduro’s swearing in on Jan. 10 – after an election that was widely condemned as fraudulent – as an opportunity to garner international support. Opposition lawmakers and exiled politicians expanded their dialogue with foreign governments, particularly the United States. The talks became urgent as the humanitarian crisis deepened. The opposition managed to put much of its past bickering and infighting behind it. “The dire circumstances forced us to unite,” said Juan Pablo Guanipa, an opposition leader from the state of Zulia. On Jan. 5, Guaidó was elected head of the National Assembly, still recognized outside Venezuela if not within it. Within days, Guaidó – a 35-year-old industrial engineer – had lit a spark of hope. 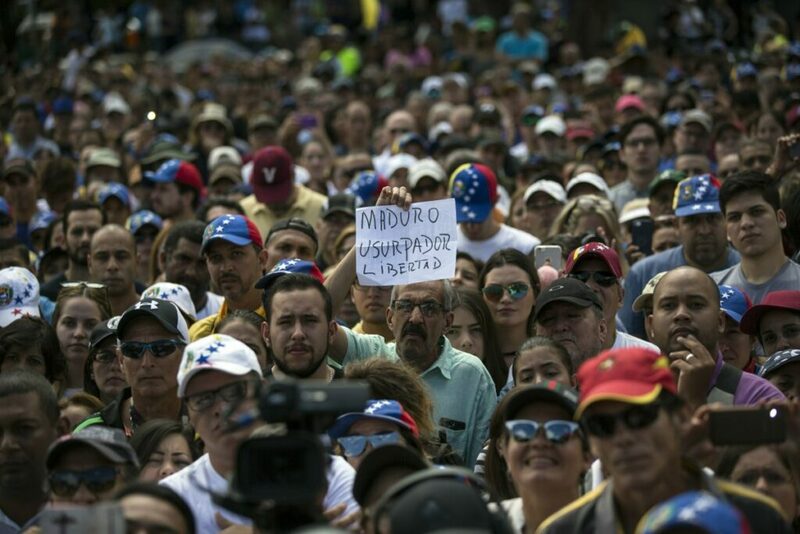 Félix Seijas, a political analyst and director of the Delphos polling agency, said surveys showed that few Venezuelans even knew Guaidó’s name a few weeks ago. But since he invoked the constitutional powers to proclaim himself interim president, and as much of the international community has coalesced behind him, he has rapidly captured mainstream support. “He is a young leader being received by a desperate population,” Seijas said. Faiola reported from Rio de Janeiro, and Krygier reported from Miami. The Washington Post’s Mary Beth Sheridan in Mexico City and Carol Morello in Washington contributed to this report.